To paraphrase Mark Twain, the death of the hoodie has been greatly exaggerated. In fact, the popularity of this omnipresent article of clothing continues to confound non-wearers. But people who do wear these items including our USMC hoodies know that there is something that is timeless about them. They know that hoodies rule. But what are the origins of this popular article of clothing and why do people cling onto their hoodies? Here is some info on what is more than a fad or fashion trend for some of us. Many people believe that the first hoodie was made back in 1919 by the Knickerbocker Knitting Company. Its former president Harold Lipson is believed to have been the first person to add a hood to a sweatshirt in order to protect athletes and laborers from the elements. Eventually workers in cold-storage warehouses and people working outdoors began to see the practicality of wearing this odd looking piece of clothing. Comfort: Hoodies are cozy and comfortable allowing the wearer to get into his/her own private space while still being out among others. Protection: As we stated earlier, hoodies were originally designed to give workers and athletes some protection from the elements without the necessity of carrying an umbrella or clumsy overcoat. They still do this. Style: Hoodies are fashionable and come in all colors, designs, etc. Individuality: Hoodies allow people to express their own sense of taste. 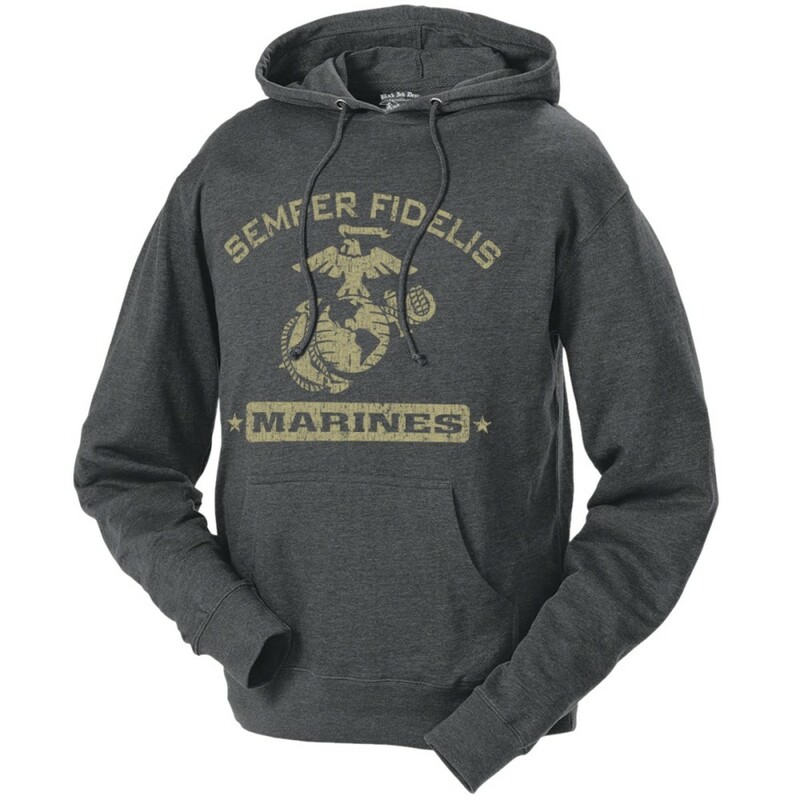 Our hoodies are embossed with the USMC emblem showing the wearer’s patriotism and love of the Corps. Some people have the logo of their favorite sports team, rock group, etc. We prefer to display the USMC emblem. We have other Marine Corps items for sale that do so as well. Versatile: Although most popular in the fall and winter, hoodies are not out of place in the spring and summer. That is because the hood can be quickly removed to cool the wearer down. Finally, despite the fact that there has been some push back against hoodies in recent times, it continues to be a popular part of many wardrobes. It has gone beyond a simple fashion statement to a lifestyle choice. This entry was posted in Marine Corps, Product News and tagged Marine Corps clothes, Marine Corps Clothing, Marine Corps products, Marine Corps Veterans, USMC, USMC Hoodies, USMC Marine Gifts by Skip. Bookmark the permalink.